The term “greenwashing” has been thrown around for many years, usually referring to companies claiming that their products are green/sustainable/organic, when in actuality they are not. Refer back to Greenette’s post on greenwashing for more info. 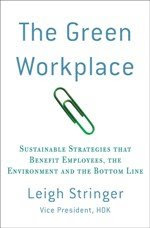 Greenwashing has really hit home in the last couple of months: my husband works for a large defense/aerospace contractor (over 70,000 employees and over $20 billion in annual sales), that according to its Corporate Stewardship report, is very committed to reducing its impact on the environment. He is contracted to a government agency that is very interested in climate change, an agency that the public puts immense pressure upon (think protestors outside with inflatable whales, etc). My husband takes public transportation to work, both because it is the right thing to do for the environment and also because commuting by automobile to his workplace can be terrible. Until very recently, he was reimbursed monthly (to a standard upset amount) for his public transportation expenditures. A couple of months ago, the program director approached him and told him that the company would no longer be reimbursing his expenses – that the reimbursement was for PARKING ONLY. If my husband wanted a parking pass, he was welome to have one, at the company’s expense, but public transit was not an acceptable use of this money. My husband was outraged (rightfully so). He has been in contact with the Corporate Stewardship representatives, the project lead, and the environmental health and safety contact for his group. While his boss supports him (in principle, if not in action), the environmental people have merely pointed him back to the stewardship report. I promised him that I wouldn’t name his company, but it’s now been a few months and with no progress – it seems like it is time to start talking about this type of poor environmental behavior. Companies this large cannot afford to be hypocritical in their approach to environmental stewardship. I liked your post. Greenwashing is becoming harder and harder to spot, and it's the better marketers that get away with it. Cheers.